Revolut uses the term 'neobank', N26 calls itself a 'digital bank', Loot says it's a 'digital current account' and Chime refers to itself simply as a 'bank'. So there isn't really a clear consensus on what to call this new breed of banking startups. At the same time, 'mobile-first fintech challenger bank' ("Fintech Banks") is my preferred term, as it's sufficiently precise. Consumer preference for interacting with the Internet has shifted from the traditional computer platform to mobile & tablet devices in a post-PC world. Ease of use and ubiquity makes mobile banking a compelling option. This situation serves banks well for a number of reasons. Greater customer interaction via an app increases customer retention rate, and allows its customers to be more informed about his/her financial life (and therefore a lower chance of going into an unauthorised overdraft). In addition, a mobile app is a more secure environment and simplifies the log-in process via biometric (TouchID, FaceID, ...) and two-factor (SMS, in-app, Google Authenticator/1Password, ...) authentication. As such, all fintech banks have taken a mobile-first (or in some cases, mobile-only) approach to building their banking business. 'Full-stack' is a programming term that describes both ends of the software development process. 'Front-end' is what the users interact with, whereas 'back-end' serves as the infrastructure. 'Full-stack' for fintech banks means the creation of an entirely new banking infrastructure, from the front-end (Mobile app-based interface) to the back-end (Payments processing, ...). One challenge that legacy banks face, even if they release a new app or a revamped interface, is the outdated back-end constrain the amount of functionality and the depth of (meta)data that they can offer. The 'challenger bank' concept originated in the UK, introduced by politicians, trade associations and financial regulators looking to further consumer welfare by increasing competition in the retail banking industry. In short, a challenger bank is an independent bank not owned by any of the 'Big 4' UK banks (HSBC UK, Barclays, Lloyds, RBS). With a few exceptions, fintech banks are tech startups not owned by a big bank and are primarily funded by venture capital firms. Each fintech bank possesses a unique 'edge' that differentiates it from the other banking startups in the space. Revolut started off as a multi-currency card. Starling is pioneering 'marketplace banking' and Monzo is trying to become a 'financial control centre'. Monese offers UK current accounts for customers with no prior address or credit history. Bunq is one of the few fintech banks that has Maestro cards as an option. TransferWise offers low-cost cross-border money transfers. Chip serves as a chatbot-bsaed savings account. Circle started off with peer-to-peer payments. Square launched as a B2C payments network. While each fintech bank possesses its own unique take on the future of banking, this space is trending towards convergence. The first wave of fintech banks launched in 2015 & 2016, aiming to revolutionise banking by providing a better current account (N26, Starling, ...) or by focusing on a unique set of features not seen elsewhere in the industry (Revolut, Circle, ...). The second wave of fintech banks arrived in 2017, with non-bank fintech startups (Such as TransferWise, Square and Chip) entering the banking space. Conventional tech industry thinking is that innovation tends to originate from Silicon Valley, before coming to Europe. This isn't the case for fintech banks. Why? Regulation driven by the European Commission created the environment and framework in which fintech banks can grew out of. 2 in particular are of relevance: The E-Money Directive and the Second Payment Services Directive. The E-Money Directive was used to harmonise and create a framework overseeing the issuance and provision of 'electronic money'. Fintech banks have taken an iterative approach to becoming a 'full' bank ('Full' as in possessing a banking licence from the Member State's financial/prudential regulator), by becoming E-Money Institutions first and partnering with companies like PaySafe and Wirecard to issue pre-paid cards. The E-Money approach has allowed fintech banks (Revolut, N26, Monese, ...) to 'soft-launch' before obtaining a 'full' banking licence. This is significant, as it normally takes 1 to 3 years to become an authorised bank. PSD2 builds on the eMoney framework and allows companies to access retail banking customer information with customer consent. This has allowed financial aggregators such as Yoyo Wallet and Bud to use PSD2/'open banking' APIs, and will subsequently increase competition in the retail banking sector (for both legacy and fintech banks). The European legacy retail banking industry has largely been slow in adopting technology, revamping apps and introducing new innovative features. The slow growth in new entrants & the tendency for customers to stick with a single bank also contribute to the stagnation of the sector. Credit card 'stickiness' is a US phenomenon. Credit card programmes such as the Chase Sapphire Reserve and the AMEX Platinum Card increase customer retention and make it more difficult for a challenger fintech bank to launch. Conversely, debit cards have been preferred historically in the EU over credit cards. For example, the residual cultural fear of hyperinflation remains in Germany, while Austrians prefer cash for privacy-related reasons. As such, the transition from using a debit card from a legacy bank (with no loyalty/rewards programme) to a fintech bank's debit card (with no loyalty/rewards programme) isn't too great of an obstacle. In addition, the US is behind Europe both in terms of payments infrastructure (SEPA, contactless transactions, EMV, ...) and on the regulatory front (eMoney, PSD2, ...). As such, launching a fintech bank in Europe is easier. While each fintech bank possesses its own unique take on the future of banking (with some entering the banking space as a non-bank fintech startup), the fintech banking space will lead to convergence in the long-run. Convergence in the fintech banking space will happen in 2 ways. Firstly, most fintech banks will obtain a banking licence and transition from being an e-Money Institution to a fully-regulated bank. Secondly, fintech banks will try to replicate the features of its competitors, therefore leading to a convergence in features. The e-Money structure is a compromise for fintech banks. It's flexible (Lower capital requirements, faster regulatory approval, ...) but only serves as a stop-gap solution. Eventually most fintech banks will apply for a 'full' banking licence (~1–3 years needed for approval), even if they don't plan to offer current accounts. A banking licence offers certain advantages over the EMI structure. For example, banks can offer a greater range of products, accept higher deposit amounts, use customer deposits for lending and offer accounts that fall under national deposit protection schemes. Each fintech bank started off by offering a unique set of features differentiating itself from its competitors, and from the legacy banks. As the fintech banking landscape matures however, fintech banks will look to replicate such features. 1) Transactions: Debit card payments, ATM withdrawal, money transfer. 2) Loans: Overdrafts, credit cards, consumer loans, mortgages. 3) Insurance: Health insurance, travel insurance, home insurance, life insurance. 4) Investment: Equities & bonds, P2P loans, savings accounts. 5) FX Conversion: Currency accounts. 6) Loyalty/Rewards Programmes: Points-based programmes, cash-back schemes. The 'edge' that differentiated a fintech bank will be eroded over time. Therefore the point of comparison between different fintech offerings will be at the cost and functionality level. In a hyper-competitive market where every fintech bank will offer the same set of 'core' banking services, industry consolidation will happen through mergers-and-acquisitions and insolvency. For example, second-tier fintech banks in different regions may do a cross-border merger to access new markets. Larger non-bank fintech startups may acquire smaller unprofitable fintech banks. Tech conglomerates may acquire fintech banks to enter the banking space, while legacy banks might do so to get access to a younger consumer base. Legacy banks modernising and tech conglomerates entering threaten to challenge the wave of disruption brought by fintech banks. While legacy banks can buy an existing fintech startup or create its own in-house, challenges remain. An outdated back-end will decrease efficiency and increase costs, and the association with a legacy brand may undermine consumer enthusiasm and 'hype' for the brand. The likelihood for tech conglomerates (with the exception of those based in China) to establish a secure foothold in the fintech banking space is slim. Increasing political and regulatory scrutiny, the possibility of anti-trust enforcement and relative inexperience in banking serve as major hurdles. Therefore while legacy banks and tech conglomerates may enter fintech banking and compete with the fintech banking startups, the most successful ones will be mobile-first fintech challenger banks. The adoption of the 'core banking stack' by fintech banks lead to commodification of fintech banking. Competition will therefore be based on price. For example, a customer based in Germany would have little incentive to switch from N26 to Starling Bank, given how the 'core banking stack' offering would be identical, and vice versa. A fintech bank will only be able to offer low prices (Fee-free ATM withdrawal quotas, price of insurance contracts and interest rates charged for loans, ...) on a sustainable basis if it achieves scale. Economies of scale only arises where there are enough users to sustain critical mass. Hitting critical mass will require the aid of network effects to ensure high user growth. 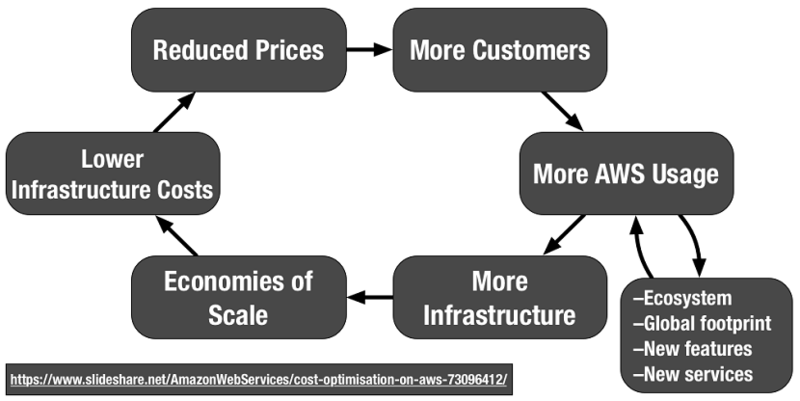 Amazon's pricing philosophy for its AWS (cloud) division is the digital services counterpart to its 'flywheel' concept. It describes a virtuous cycle where scale begets scale, investment will lead to lower costs, and savings from lower infrastructure costs can be passed on to consumers, which will subsequently lead to an increase in customers. The situation is similar with fintech banks. A price-based competitive environment (due to commodification) will lead to decreasing margins and an intensifying of competition. Fintech banks may adopt a loss-leader strategy in order to 'buy' market share, which will not be sustainable in the long-run. With increasing competition, the industry will consolidate (with banks acquiring each other or becoming insolvent) and shrink to a small 'core' group of fintech banks. The remaining fintech banks will need to compete by building the 'Layer 2' banking stack. One interesting approach that is being pioneered by Starling Bank and Monzo is 'marketplace banking', where the bank serves as a hub for third-party financial services providers (e.g. Pensions, savings & investments, ...). This is similar to Slack's approach, with their core messaging platform augmented by the many third-party apps available for integration. The issue with marketplace banking is that its vision of an open ecosystem of financial services is unrealistic. The number of financial products and asset classes are finite, and the point of comparison tends to be on price (Percentage fees for investments, interest rates for loans & mortgages, ...). A 'winner-takes-most' situation will arise, with customers flocking to the fintech bank that offers the cheapest products. American Express uses 'integrated closed loop model' approach, where they own the entire value chain. This gives them more data points and greater insight into spending patterns, and are therefore better able to adjust their points-based reward schemes. Payments Network: A private global payments network that connects merchants and consumers directly, thus bypassing all intermediaries (and the costs/fees charged by them). In-network P2P Lending: A P2P lending system where both consumers and merchants (who would have previously used treasury services from investment banks) can invest their deposits into P2P loans lent to individuals and companies. Cost of lending (interest rates charged) will be very low due to access to cheap liquidity. Liquidity: The 'closed loop' nature of 'Layer 2' will allow capital to be recycled into the network (via P2P loans and cross-currency payments) and acquired very cheaply, leading to lower costs (Cheaper fees for merchants, low/no fees for consumers, low interest rates for loans). What these three components of 'Layer 2' have in common is that it requires immense scale, with a large amount of users participating to make the model viable, and is incredibly difficult to replicate. The gravitational pull of customers and capital towards fintech banks with 'Layer 2' will lead to an increasingly consolidated fintech banking industry, with a small number of incredibly large fintech banks. -4) Who Stands A Chance? One pervasive theme in the tech industry is that of duality, with arch-competitors looking to emulate the other. Software companies looking to produce hardware, and hardware companies launching subscription software services & platforms. Social networks wanting to enter the enterprise SAAS space and tech conglomerates wanting to do social. 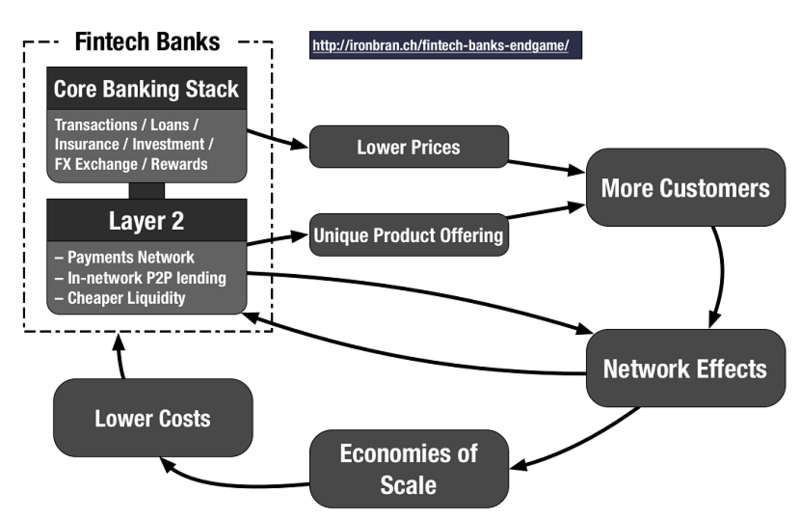 For fintech banking, it is between (fintech) banks, and payment networks. Every fintech bank that will scale to a billion users will have its own internal global payments network. Building a retail bank from scratch is difficult. While companies such as Wirecard, PaySafe and Green Dot allow fintech startups to offer pre-paid debit cards, creating an integrated offering is difficult. There are certain limitations to pre-paid debit cards, and auxiliary banking functions (Lending, insurance, investments, ...) need to either be built from scratch, or sourced elsewhere. Building a payments processing network is even harder. At the current moment, there are the main 2: Visa and Mastercard. In addition to building the infrastructure itself, there is the laborious task of giving merchants access via physical payments terminals. Very few companies have the capital and the scale to do this. Therefore, the fintech banks who aim to be the first retail bank to have over a billion users will be those who decide to build a payments network, and create its 'Layer 2' banking stack. Among the three contenders that I've identified, Revolut is the furthest in terms of building its core banking stack. It has a singular focus on execution speed, launching a significant number of core services in 2017 (Bill splitting in January, support chatbot and UK current accounts in February, launched Revolut Premium and Revolut Credit in March, PLN & CHF in May, 11 new currencies and Revolut for Business in June, raised $66m, launched personal EUR IBANs and held a £4m crowdfunding round in July, a promotional programme in August, Revolut Insurance in September, released 'standing orders' in October, applied for a EU banking licence in November and became the first mainstream financial services institution to offer cryptocurrencies support in December.). In addition, Revolut has publicly announced (as early as June 2017) that its 'final goal' is to build its own payments network. Its current expansion plans for North America and the Asia Pacific region are aggressive and will allow it to build scale, both on a geographic level and in terms of customer count and transaction volumes. While certain parts of their core banking services are outsourced to third-party providers (Revolut Credit uses Lending Works, while Revolut Insurance is a partnership with Simplesurance), as Revolut gains enough users and builds its 'Layer 2' banking stack, it will be able to bring these services in-house, and channel customer deposits and customer-driven P2P loans to provide insurance and low-cost credit within its ecosystem. TransferWise originally started as a P2P currency exchange network, which matched customers who wanted to convert one currency to a counterpart customer. TransferWise's edge is its massive user base (2011 launch) and the huge volumes transacted internationally over its network. It has three revenue-generating business lines (TW app, third-party integrations and Borderless) and is aggressively expanding into Asia Pacific in 2018. In addition, the 'Borderless Account' roll-out was very rapid. It was announced in May 2017, invited consumers to test out the service in the following months, added Borderless functionality to its mobile app and launched a private beta of the TransferWise debit card in January 2018. It will be unsurprising if TransferWise decides to take the reverse approach (starting with 'Layer 2' infrastructure) and build the core banking stack from scratch. Square started off as a manufacturer of mobile-based credit card terminals, but now has a well-diversified business model, with a payments processing platform, a digital payroll business line, a business loans arm, a food delivery app alongside its original hardware division. Square launched Square Cash in 2013, as a P2P consumer payments app, and opened its platform to businesses in 2015. Jack Dorsey (Square CEO) teased the Square debit card in April 2017 and promptly launched a private beta a month later. With Square Cash serving as a launch platform, there is a possibility that Square might enter fintech banking (by applying for a consumer banking licence), and over time, pair it with its existing payments processing network to connect merchants and consumers together. Retail banking is, when reduced to its irreducible core, just entries in a database interacting with other databases. It is (strangely) similar to tech companies, where scale, network effects & access to capital can increase its ability to compete on an exponential level. While the fintech banking scene is incredibly competitive at the current moment, with a significant number of new and existing players, in the coming decade the landscape will be very different. One vision of the future of fintech banking is marketplace banking, where banks serve as 'app stores' where customers can access a wide variety of financial products through open APIs. A fintech bank can, by building its 'Layer 2 banking stack', create a more compelling proposition for users, by offering lower prices and a unique set of product offering. A low-cost and unique banking service will increase customer count and transaction volume growth, leading to positive network effects and giving the firm economies of scale, thereby increasing the effectiveness of further investment and resulting in lower costs. A few incredibly large and dominant fintech firms will remain. This was originally written in June and September 2017, revised in January 2018 and re-published on ironbran.ch in February 2018.